There was an impressive array of speakers at this year’s Growing Global event. 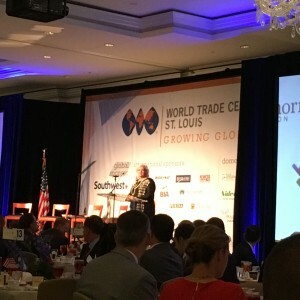 I was a guest of Susanne Evens, president of AAA Translation, at the 2016 Growing Global event hosted by World Trade Center St. Louis this past Friday. It was an impressive gathering that was well represented by many of the St. Louis region’s key economic driving forces. Senator Blunt was on hand, as were Mayor Slay and Steve Stenger, the County Executive. All three gave strong overviews of the tremendous potential of the St. Louis region to become a major player in global economic development. Some might scoff at that idea, citing the numerous corporations that have left the area and our not so international airport. But what many people don’t realize is what a hub the St. Louis region has become for plant science research and innovation. Agriculture, technology and innovation are three key areas of growth that currently have outstanding foundations here in the St. Louis metro area. The importance of all three in the not-too-distant future is going to increase as the population of the world continues to expand, combined with climate change and a dwindling water supply that will create demands on the world’s food supply that are hard to even fathom. A lot of the research and development on these issues is being done right here in St. Louis by institutions like the Donald Danforth Plant Science Center. Monsanto is another major player in the global market and there are numerous other companies with major ties to agriculture as well. More international companies are being attracted to the market, lured by our Midwestern work ethic, strong school systems and overall quality of life. Of course, all of that is debatable. The national spotlight certainly hasn’t shined very favorably on this region over the past few years and if you meet someone from out of town, you may find yourself trying to explain that St. Louis is a way better place to live and work than what has been shown via social media. I have always believed St. Louis is poised to reclaim its spot as the true center of our country – transportation-wise, we should be a hub with railways, airlines, river traffic and highways – but there’s a lot of work to be done. I’m not sure if we’ll ever conquer the City-County divide but if we can pro-actively work as one to promote the region, particularly with a focus on attracting global business and foreign direct investment, there’s some cause for optimism. Which brings me to the title of this particular blog piece – the confusing case of marketing St. Louis on a global stage. Upon leaving the event, I was totally pumped after hearing all of the speakers talk about the tremendous potential of further growing our ag/tech/innovation global presence. There was a handout given to everyone called the Metro St. Louis Export Plan. In it, I expected to read more insights into how we’re going to more effectively target this lucrative and vital potential market base. Instead, I read about four strategies that had no mention of the importance of this focus and the topic only garnered a paragraph under Policy suggestions. I understand the importance of getting companies and institutions throughout the region to get on board with the push to become more of a global player. It just seemed that all the talks we heard were focused on one direction and then this piece ventured off on a whole new tangent, all under the “St. Lou is Global” theme line. The event also featured a speaker forum that featured key execs from global companies that do business here. The panel consisted of Fernando Merce, president of Nestle Purina Latin America and Caribbean; Antonio Santos, vice president of operations of Biomerieux; Greg Gorman, vice president of business planning and development for Nidec and Derek Bartlem, who leads the KWS Gateway Reserach Center. All of these gentlemen talked about the importance of how branding for the region needs to be improved and the major strengths of the area need to be better communicated. St. Lou is in need of better communications. We have a tremendous story to tell. Luna Mae wearing her protective cone. 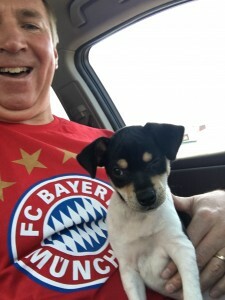 Back on June 24th, we gained an additional member of the family – a rat terrier that we named Luna Mae. Earlier in March, our dog, Annie, died while we were away on vacation. There was considerable discussion as to whether or not our household needed another dog. Catherine was leaving for college. Michael was beginning his junior year at Mizzou and Tom had officially graduated from SLU. We were potential empty nesters, free to move about the country. However, I lobbied hard for a dog. Working from home, I was facing an empty house. In the evening, Chris is often attending some sort of meeting as her volunteer time for groups and organizations considerably outdoes mine. Catherine and I searched a variety of rescue websites, in search of a new puppy but the timing didn’t seem to be working in our favor. We were gone for two weeks in early June and immediately upon our return, I was set to attend a trade show in Las Vegas. That’s when I decided to investigate rat terriers. Annie was an awesome dog and the rat terrier breed is a high energy, quirky but totally lovable breed. I discovered a breeder in Lebanon, Missouri that had a new litter of pups on their website. One of the pups was named Hannah, and seeing that Catherine’s middle name is Hanna, which is Chris’ mom’s maiden name, it seemed like a sign. We inquired about Hannah and were told she was available and that they could hold her an extra week so that we could get her upon my return from Vegas. Even though it seemed like a sign that the pup was named Hannah, we didn’t want to stick with that name so Catherine came up with Luna which had that ‘nah’ sound to it so as not to confuse our new pup too much when we shifted her name. We made it Luna Mae to give it a bit of a country sound, reflecting her mid-Missouri roots. Luna Mae joined our household on June 24th as a 9-week old pup. Luna Mae has been with us now for about 2-1/2 months. Sometimes, we call her Lunatic. Other times, we think about what an act of lunacy it was to get this puppy who takes up so much of our time and is quite adept at chewing up shoes, chair legs and other assorted items while having a fascination with eating live worms and bugs whenever possible. On Thursday, Luna was spayed, so currently, she is sporting a plastic cone wrapped around her head which she has been working hard to figure out how to destroy it. Our vet told us it was important to not let Luna get too active. After just a day-and-a-half of sporting her conehead, we have found that to be a challenge. So this Labor Day weekend, I’m laying low with Luna, trying to make sure she doesn’t rip her stitches open from her operation while escorting her on a leash in our backyard encouraging her to do her business and we’re both enjoying this idyllic weather. She (and us) will be dealing with the cone for about ten more days. Then it’ll be back to the on-going adventure of raising the pup. Though Luna Mae is proving to be a major commitment, there’s no doubt, she’s a keeper. 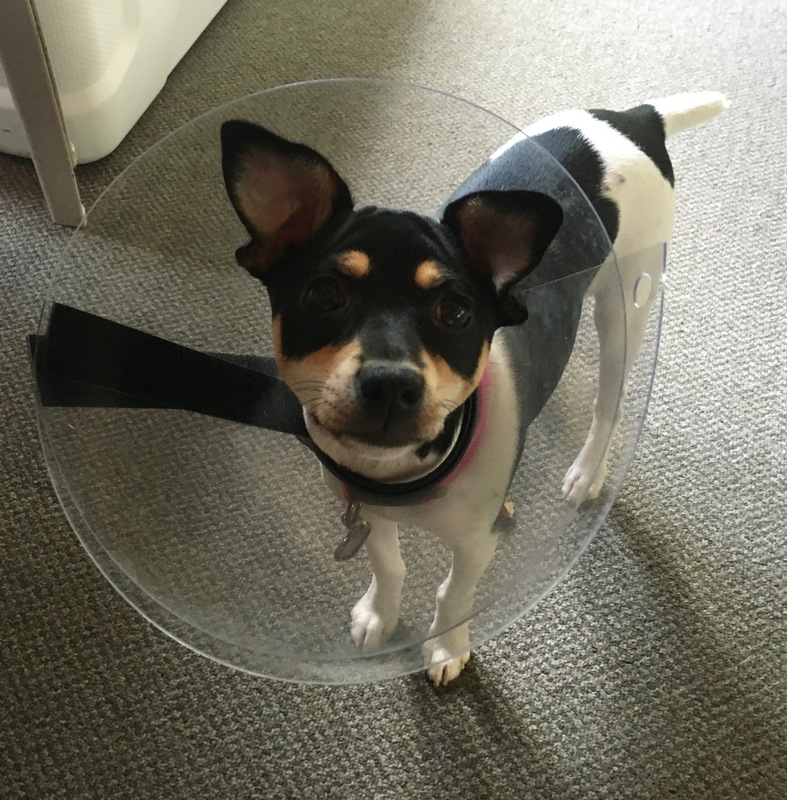 This weekend, our labor of love is a little 11-pound pup with her head wrapped in a plastic cone. Long may she live!